BANGI, 15 Nov 2010 – Universiti Kebangsaan Malaysia (UKM) is opening the doors to all its seven research stations in the country to tourists with different tour packages that would allow them to experience and gain knowledge about nature, the plants and animals in their natural habitats. The stations dubbed “living labs” are the Tasik Chini Research Station, the Mersing Marine Ecosystem Research Station, the Fraser’s Hill Research Station, the Lata Jarum Freshwater Recreational Forest Research station, the Sungai Pulai Research Station, the Langkawi Geopark and the UKM Bangi Permanent Forest Reserve that includes a Herbs and a Ferns garden. 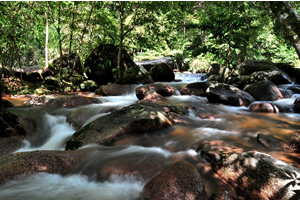 Except for the Sungai Pulai and UKM Bangi Permanent Forest Reserve which are available for half-day visits, the tour packages for the rest are for two days and one night or three days and two nights’ stay where the visitors can get to see, experience and learn about the country’s nature and how the local people are living off the land. 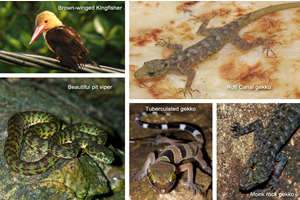 They will also know why the environment, plants and animals are being conserved by the university’s scientists and researchers. These tour packages called “Knowledge Eco Tourism” were offered by UKM Vice Chancellor, Tan Sri Dato’ Dr Sharifah Hapsah bt Syed Hasan Shahabudin at her briefing to the Minister of Tourism, Dato’ Seri Dr Ng Yen Yen, during her working visit to UKM last Wednesday (11 Nov 2010). 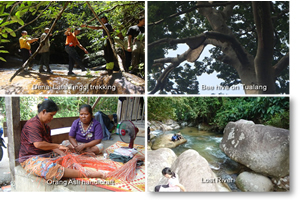 “UKM’s aim is to add value to ecotourism by sharing knowledge in well-packaged tours as well as training modules for tourist guides,” she said. The university, she stressed, is a repository to knowledge about the environment with its biodiversity and culture of the people and much of this knowledge is not transmitted to the people. What better way could there be than to have “responsible travel to natural places to experience and gain knowledge from multi-factorial ecosystem approach research that is being carried out to conserve the biodiversity and improve the well-being of the local community through active engagement,” she added. 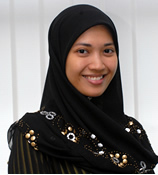 UKM, Prof Sharifah Hapsah said, would like to collaborate with the Tourism Ministry by linking the tour offers portal (myktours.com) to the ministry’s web site; promote them to hotels, tour agencies and tour associations, and appoint the university for the training and “certification” of tour guides in the “K Eco Tourism” programme. At the same time, the university is seeking some funding from the ministry to build some facilities for the visitors to the “living labs” like camp sites, stand-alone power generators, bird hide, canopy walk, conservatory for temperate and mountain ferns and a research grant to draw up the standards for K ecotourism. Dr Ng, in her speech, welcomed the eco tourism move by UKM, saying that it could boost the tourism industry, which is the 2nd biggest revenue earner for the country. She also noted the country needed well-trained tour guides, who could provide the correct information about tourist destinations, culture and other information about the country and people. All these tour packages are handled by K. Eco Tourism Shd Bhd, a start-up company of the university. Under the tour packages for Tasik China, visitors can go for a walk along nature trails, savour forest delicacies, a day or night cruise, listen to stories by a Tok Batinor headman of the orang asli, watch their ritual dance or the natural remedies, as well as watch the sunrise over the 2nd largest freshwater wetland in peninsular Malaysia that has been designated as a Biosphere Reserve by UNESCO. They could also see how the researchers catch bats, frogs and other animals for study before releasing them. 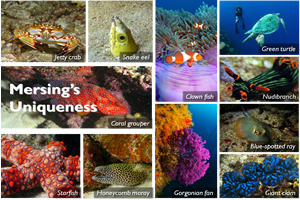 Visitors to the Mersing Marine station can have the chance to go fishing for squids, crabs or shrimps depending on the season, jungle trekking, a mangrove tour, scuba diving, water safety lessons, a visit to Mersing town, fish cake factory, goat/cattle farms, apart from local cultural show and of course, a seafood galore for which Mersing is famous for. 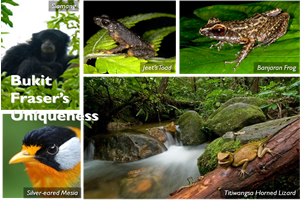 For those who prefer the highlands, the Fraser’s Hill station offers the chance for birds, butterflies and moths watching, a rugged trek through the research station and see bio-engineering at work, or the ferns and orchids as well as a swim at the Jeriau waterfall. 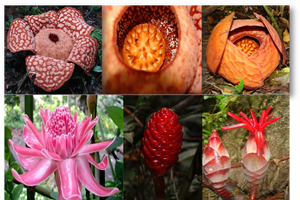 Those seeking an experience in a pristine jungle can go for the Lata Jarum package where they can go jungle trekking and see the Rafflesia, birds, orchids, moths, butterflies and stick insects or the numerous wild bee hives hanging from the branches of the tall Tualang trees. They may also go for a night walk or a swim, and eat all the fruits like durians, dokong and the like that are in season. 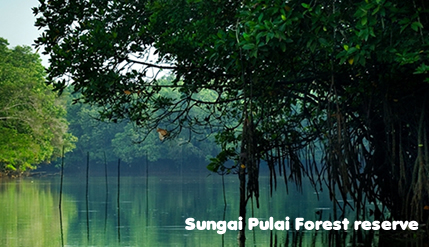 The half-day tour at Sungai Pulai is a speedboat ride to see the mangrove, wildlife and seabirds in their natural home. 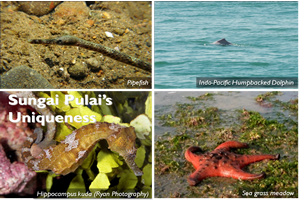 If the visitors are lucky, they may get to see dolphins or the otters in the area. The visit to the Bangi Permanent Forest Reserve offers visitors the chance to learn the different herbs and their uses, the ferns and their propagation. 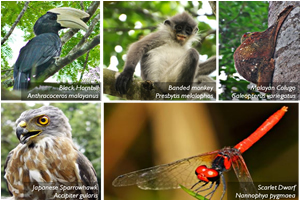 Or they can take a trek through the jungle trails of the forest that is home to a lot of wildlife, like birds and the macaques. Senior Manager for Business Development of K. Eco Tourism, Cik Faa’iqa bt Abdul Rashid, said they would work with tour and travel agencies to sell these packages. “At the moment, we are making arrangements to bring the decision-makers of these travel and tour agencies to see what we have to offer at these research stations in late December,” she said.